New prime minister, same health secretary: what now for nurses and the NHS? Will a new Conservative government mean change for nurses, the NHS and the people who use it? 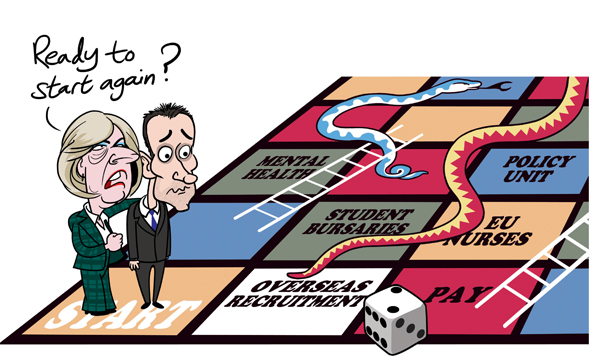 The appointment of Theresa May as prime minister and her unexpected decision to keep health secretary Jeremy Hunt during her cabinet reshuffle sends out conflicting signals. At the Department of Health (DH), there have been a number of junior minister changes, with Philip Dunne moved from the Ministry of Defence to minister of state for health, the second ranked position behind Mr Hunt. Nicola Blackwood and David Mowat were named parliamentary under secretaries of state. The RCN has said the changes in government are a chance for a ‘fresh look’ at key issues for nurses. So what are the key issues facing the new government? Last November, the then chancellor George Osborne announced that NHS bursaries for nursing students in England would be replaced by student loans. A government consultation on the issue closed on 30 June. Unions have campaigned strongly against the change, which they argue will reduce numbers of nursing students, particular mature students and those with families. London mayor Sadiq Khan is the latest to back the RCN campaign, stating that the move could increase health inequalities in the capital. ‘Recruitment and retention of nurses, midwives and allied health professionals in London will be made harder by the scrapping of nursing student bursaries,’ he said. Nuffield Trust director of policy Candace Imison said that the combination of Britain leaving the EU and plans to cut the bursary could create a worrying workforce gap. ‘If the government goes down the bursary path, it should be thinking about options to incentivise nurses to stay in the NHS, like paying some of their loans,' she said. The RCN has urged the government to consider the vital contribution of the 33,000 EU nurses who work in the NHS during negotiations to leave the EU. At present the future of EU residents living in the UK is unclear following the Brexit vote on June 23. Ministers have so far refused to guarantee that they will have the right to stay. NHS England chief executive Simon Stevens recently urged the Government to assure NHS workers from the EU that their jobs were safe. James Buchan, staff associate at the Institute for Global Health and Development at Queen Margaret University, Edinburgh, said there would be a shift towards recruiting more nurses from outside the EU to work in the NHS, despite the more cumbersome migration process involved. Nursing leaders will be hoping that plans to axe the DH’s team of nurse advisers are reconsidered. Plans to axe the nursing, midwifery and allied health professions policy unit have been roundly criticised. The International Council of Nurses called the move ‘deplorable’, while an emergency resolution condemning the proposals was passed unanimously at RCN congress in June. The DH told Nursing Standard that there were currently no plans to save the team, believed to be part of wider job losses to cut the department's running costs by 30% in the next five years. Unison head of nursing Gail Adams urged the DH to reconsider the plans. ‘Now is the opportunity, with a new prime minister, to give everything a bit of a health check and make sure we are moving forward with the right staff to tackle the major challenges,’ she said. In her first speech after becoming prime minister, Theresa May suggested that mental health was one of the ‘burning injustices’ that needed to be tackled. ‘If you suffer from mental health problems, there's not enough help to hand,’ she said. One in four adults in England has been diagnosed with a mental health problem, however research collated by the NHS Confederation’s Mental Health Network suggests that funding to services is being cut. RCN mental health adviser Ian Hulatt urged Ms May to invest in services for children and young people, support campaigns to remove the stigma surrounding mental health problems and invest in the mental health workforce. He said having a minister whose sole focus was mental health would be welcomed. The former prime minister oversaw a period of pay constraint that hit nurses in the pocket, with nurses and midwives staging a four-hour strike and work-to-rule to secure a 1% pay rise in 2014. The government announced in March that the NHS would pay increases at a maximum of 1% a year between now and the next general election. The Commons health committee warned that the ‘unsustainable’ pay cap could mean the NHS struggles to recruit and retain nurses. Andrew Lansley, Mr Cameron’s first health secretary, launched a major reorganisation of the NHS in England that saw primary care trusts and strategic health authorities abolished. More commissioning responsibilities were handed to GPs under the plans, which began in 2013. Think tank The King’s Fund described the reorganisation as ‘disastrous’. Mr Cameron was also in power when devastating care failures at Mid Staffordshire NHS Foundation Trust between 2005 and 2009 came to light. Robert Francis QC, who led the independent and public inquiries, said a chronic shortage of nursing staff was one of the causes.